Lab Zero’s Indivisible is a strange game, but I wouldn’t expect anything less from the developer of Skullgirls. A cross between an RPG, platformer, and fighting game, Indivisible was something that I knew little about heading into a recent demo. But after a half hour hands-on session that ended far too early, Indivisible is a genre-blending game that is as exciting as it is rough around the edges. 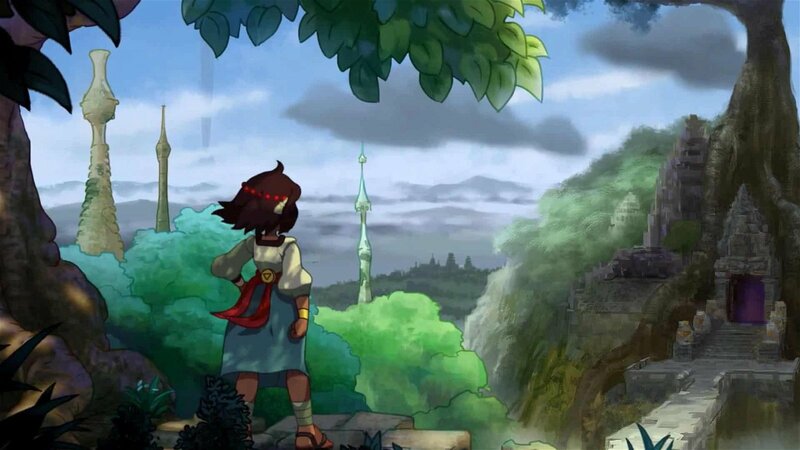 Indivisible follows Anja, a tomboy who gets swept up in an adventure after her village is attacked by a menacing army. My demo was set inside a prison, after Ajna and her party were captured, with the goal of breaking out and defeating its commander. This section takes place a few hours after the start of the game, and while I wish I could have played through the opening, it’s clear that Indivisible has a lot of heart. The writing is filled with jokes and anachronisms that you wouldn’t expect to see in a fantasy RPG influenced by southeast Asian mythology, but it’s charming, and the biggest compliment I can give from what little I saw is that I want to see more. Particularly since Ajna’s special ability allows for a lot of interesting character interactions. While the specific details of it weren’t made clear to me, Ajna has a special power that lets her absorb individuals into herself. That means every party member you see in-game resides within her mind, coming out into the physical world only in battle and in rare occasions. It’s a unique twist, but one that I did not get to fully explore in my brief playthrough. Instead, I spent much of my time delving into Indivisible’s two halves: its exploration, and its combat. 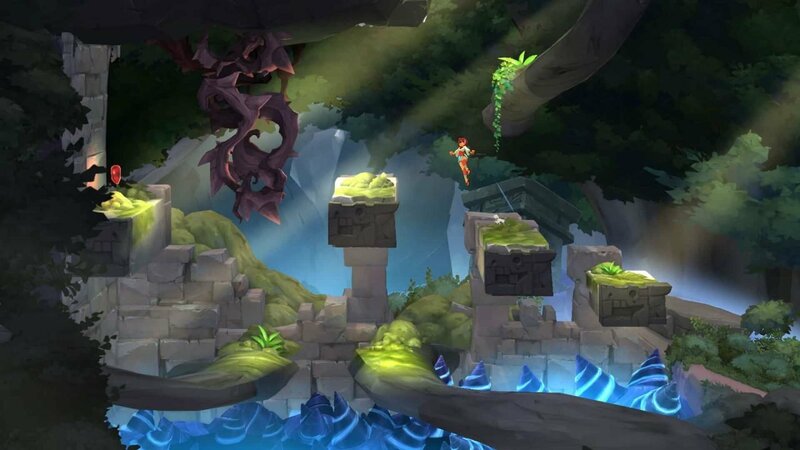 There is a large focus on platforming in Indivisible, but rather than just jumping and sliding through obstacles, Ajna can also use her axe to grab onto walls in order to reach a better position. 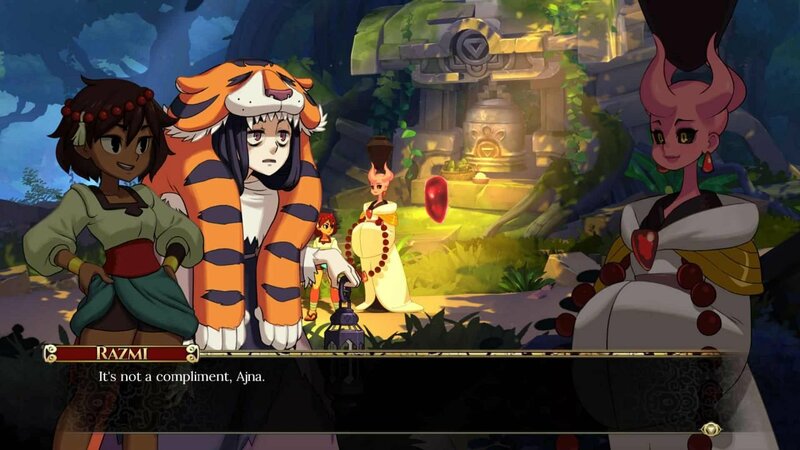 505 Games, Indivisible’s publisher, said that Ajna will gain a variety of abilities that she can use to traverse the environment. One such ability, unlocked after recruiting a new party member that specialized in using a bow, allowed me to covertly take out an enemy that was otherwise unapproachable. It takes a moment to get used to the controls, but before long I was jumping through vents and smashing down doors with ease. 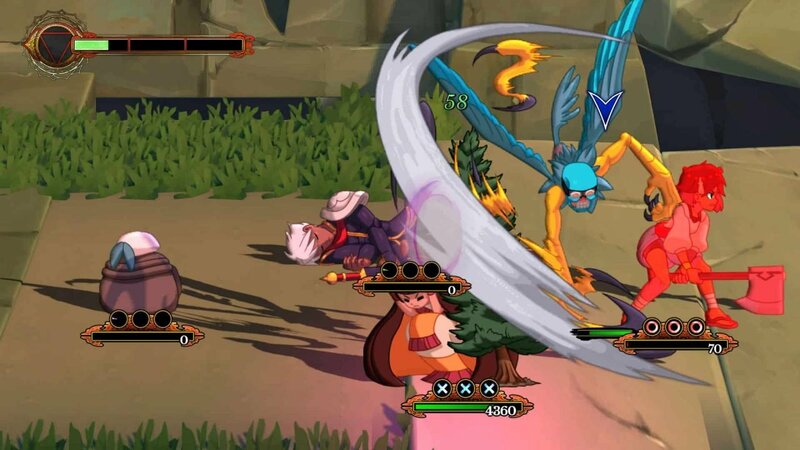 In its battle system, Indivisible plays like a cross between fighting games and Valkyrie Profile. Each character is assigned a face button, and by pressing that button you unleash attacks, though in the demo I played there was a limit of two attacks per characters before they would have to recharge. Additionally, by pressing up or down when activating an attack, you can unleash powerful blows that can break down an enemy’s guard. There’s a rhythm to the attacks that I really enjoyed, and setting up a combo after breaking through a boss’ guard is both exciting to watch and deals a lot of damage. Far from being simple, there’s plenty of actual depth to the combat. Continuing the fighting game comparisons, there’s also a special meter that fills up when you successfully connect with an enemy. When it’s full, you can activate a character’s special attack, which can range from a high damage combo to healing for every party member. What’s more, you can use the special meter to guard against attacks, as well as revive downed characters to bring them back into the fight. Considering the large number of characters who join Ajna in her journey, each with different specials and attacks, and you have a battle system that allows for plenty of experimentation. It’s also well-animated, with an anime-inspired style that pops in both still frames and in how the characters move and attack. While most of my time with the game was spent inside a prison, the design of the prison, evoking both typical fantasy elements and early 20th century decor, made it stand out from similar fantasy RPG’s. Though the gameplay mechanics and story are well in place, Indivisible clearly has more development ahead of it, as there were placeholder assets and text in place throughout the demo. Humorously, even the voice acting wasn’t in place yet, as I was instead treated to a robotic cast that was just a slight step above Microsoft Sam. Despite this small issues, I am impressed by what Lab Zero has accomplished so far. The great fighting game inspired mechanics, irreverent writing, and gorgeous world design, have me looking forward to seeing what Indivisible will look like when it launches later this year.